We'd really hoped the odiferous garlic clips we used on the trees would be enough to deter animals, but alas, our orchard was under attack! Only two were damaged, and they weren't even badly hurt, but still, there was no way we're going to leave them exposed. 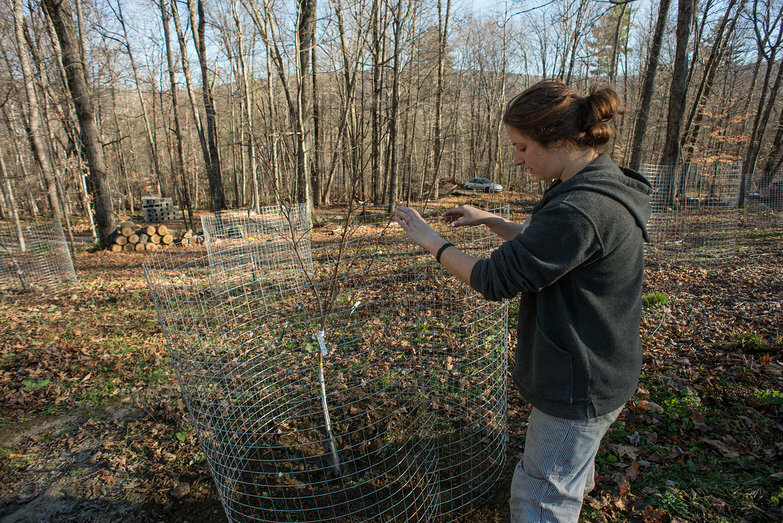 I returned from Boston same evening, and the following morning, we spent the day making wire cages for all off the trees. The process took the entire day, but now our trees are safe… I hope! Any idea what it was? Deer? porcupine? Glad you learned this without 2-3 feet of snow on the ground. I'd add 2-3 tposts to each cage, so the deer can't push them over. 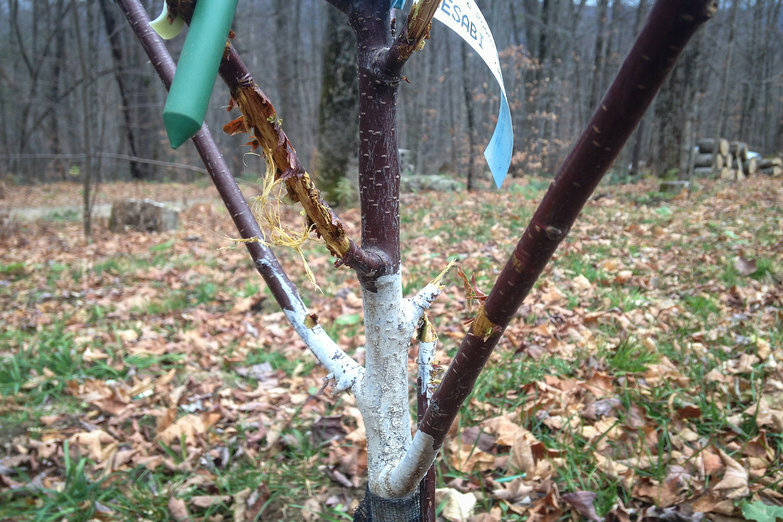 I didn't want to be discouraging when you posted about the orchard earlier, but deer decimated my apple trees the first winter they were in and I'm just over the border in NY. I ended up putting two t-posts and a fence ring around them each fall and it worked well for the last two years. Usually it's the first snow that really signals their reign of fruit tree murdering terror so you might have lucked out with the warmer weather so far. I second the recommendation on the t-posts. Good luck. Yes, definitely posts are good. We had to attach a second layer of fence above the first one, overlap ping it a bit for stability....with wire ties. Last winter the deer here, reached over the 5 foot fence, I am told sometimes standing on their hind legs, to gnaw on the bark of the trunk as well as branches. We had an approx. 5 foot diameter cage last winter. Good luck! Good crowdsourcing here! Question for all: does it help if you fill the cage with leaves to prevent the deer, or does that encourage nesting smaller animals? Don't forget that rodents love fruit tree bark, too. Ditto the going taller...might even want to increase diameter of cages. Definitely NO to filling with leaves, just gives rodents cozy cover, the snow will give them enough cover to chew trunk bark.....might want to wrap trunk against rodents, not sure of best product for that. Ditto on not wanting to be too negative when you first planted...such a Catch 22. I'm delighted to see you are still roughin' it in VT. A couple of years ago I made a gift to your cause and was hoping you were still living in my favorite state. I get to VT whenever possible and some day my ashes will be strewn on the beautiful lawn in front of the Capitol in Montpelier. All the best wishes for a happy 2016....d.
Joy-- Our friend Mark thinks the broken branches was a buck. The other one... it didn't seem like a deer. Not really sure? Anne & ET-- Thanks for the advice--we picked up some t-posts a few days ago and are going to attempt putting them in the ground soon. 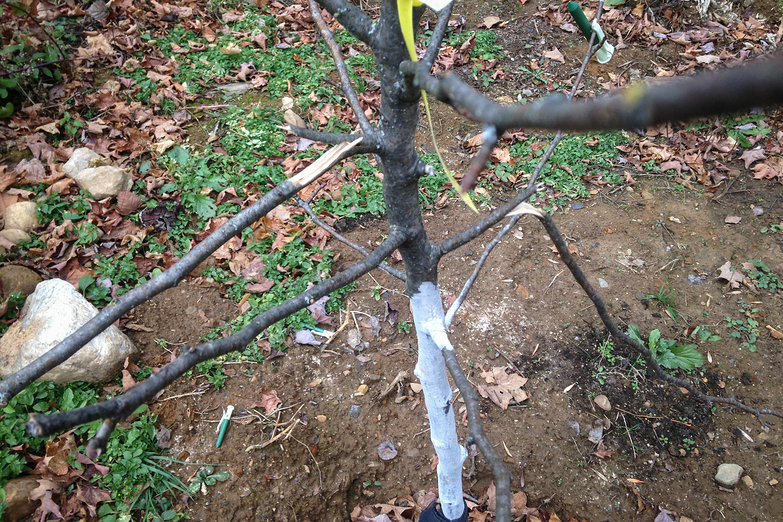 We'll call our orchard and ask about rodent protection next week. Ben-- Not discouraging at all--hearing your experience is super valuable for us, thank you for sharing. We hope your trees are okay now! Don-- Thanks so much for reconnecting Don, all the best and happy new year to you too! The scraping could be buck too.....a 'rub'. That's why you need strong posts.